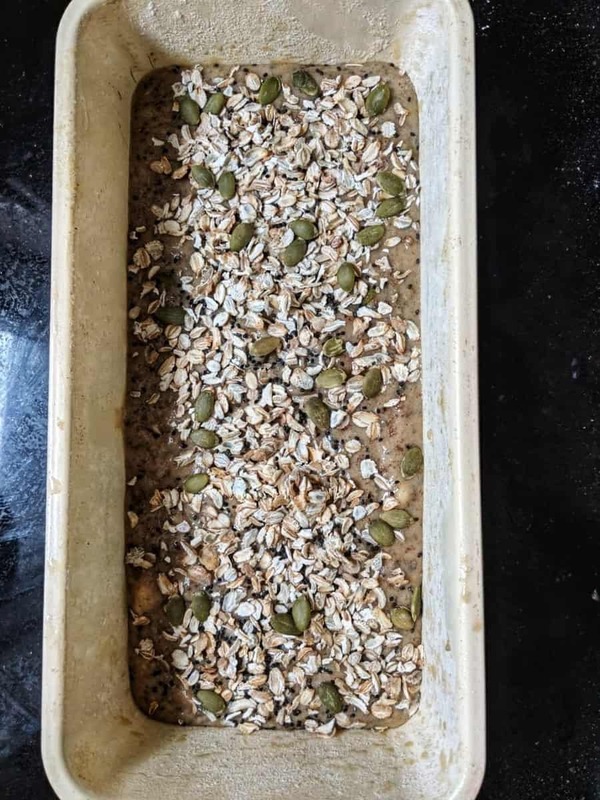 Ripe bananas, goodness of whole-wheat flour, earthy crunchiness of pumpkin seeds, chia seeds and rye flakes make this guilt-free loaf of bread that you do not have to think twice about while eating or packing in your kids’ lunch box. The smell wafting through your kitchen as this bakes is a reward in itself! Ever since I started incorporating wholesome grains into my baking, my craving for sugar-laden refined flour desserts when I’m out has gone way down. I hardly ever order pastry or cake slices when I’m in a coffee shop, and whenever I do gawk at the confectionery shelves it mostly has to do with observing the variety and making a mental note to try making it at home – with a much healthier spin to it, of course. I have tried the recipe with eggs and the eggless version as well, and in both cases loved the result. I’ve come to love the eggless version more, since that faint egg-y smell that creeps through otherwise is missing in it. I prefer my banana bread loaf to be very mildly sweet and hence add very less sugar, but you could tweak it to your preference. I add toasted pumpkin seeds, rye flakes, walnuts and chia to my loaf, but you could use any nuts and seeds of your liking. 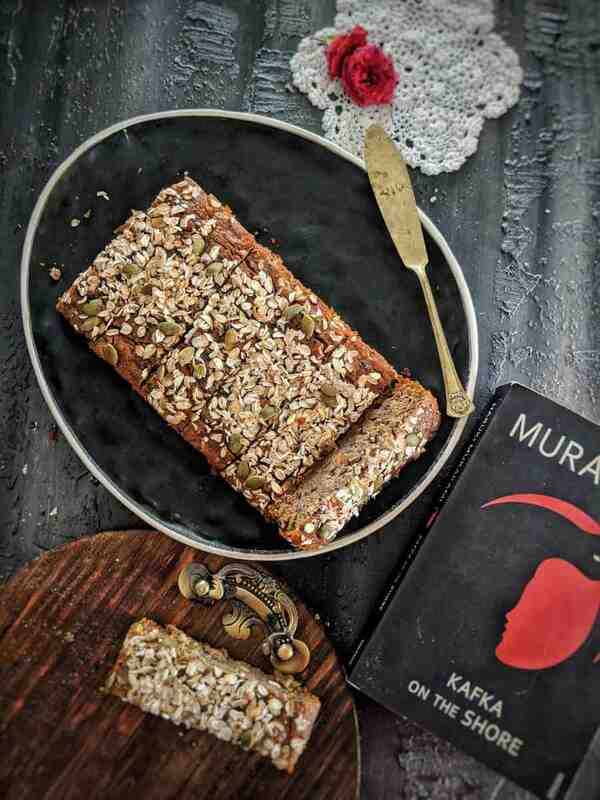 If you’re looking for healthy bakes, do try my Cherry Upside Down Ricotta Cake, Lemon Poppy Seed Buckwheat Muffins , Pumpkin Spice Barnyard Millet Cake with Cashew Butter Icing or Wholewheat Chocolate Ganache Cake too! Pre-heat the oven at 180°C. Grease a loaf pan and lightly dust with flour. In a bowl whisk together all the dry ingredients, i.e. flour, salt, baking soda and baking powder. Mix well with a spatula. In another bowl, combine the wet ingredients, i.e. mashed bananas, palm sugar, vanilla essence, eggs/ yogurt/ milk, oil, in a separate bowl. Whisk everything together until the palm sugar melts. Add the dry ingredients to the bowl with wet ingredients, mix everything together while scraping the sides with a spatula. Add nuts and seeds (I sprinkled some on the top too). Take care to mix only well enough to make a smooth batter; do not overmix. Bake at 180°C for about 40 minutes, until it has risen firm and a toothpick inserted in the center comes out clean. Remove the pan from the oven and allow to cool completely. Run a knife along the rim of the pan, turn it upside down and remove the loaf gently. Keeps in the refrigerator for 4-5 days. Can be frozen for a month and thawed before use. *Recipe is for 12 slices; all values in grams.